Published: June 20, 2012 at 03:59 p.m. Updated: Aug. 31, 2012 at 02:16 p.m.
Versatile defensive lineman Muhammad Wilkerson displayed an ability to wreak havoc as a rookie last season. The New York Jets have been one of the top defenses in the NFL under Rex Ryan, utilizing a 3-4 scheme that has been problematic for opponents. However, Ryan and defensive coordinator Mike Pettine have recently talked about moving to a four-man front in 2012 to take the defense to another level. 1. Switching to a four-man front allows the Jets to put their best players on the field. The best coaches in the NFL are willing to tailor their tactics to fit the strengths of their personnel. Clever strategists will focus on putting their best players in the ideal position to make plays. In the Jets' case, Ryan and Pettine are revamping their scheme to build around a young, athletic defensive line that could emerge as one of the NFL's best units in 2012. Muhammad Wilkerson, a second-year pro from Temple, is a catalyst for the move with his size, strength and athleticism. He is a versatile defender with the ability to play anywhere along the line, and the Jets can really tap into his position flexibility by using a four-man front. In a conventional 4-3, Wilkerson would ideally fit as a three-technique, aligning on the outside shade of the offensive guard. He displays an explosive first-step and excels creating penetration in the middle. Given his impact and production, Wilkerson will command double-team attention on the majority of snaps, freeing linebackers Bart Scott and David Harris to flow freely to the ball. The addition of Quinton Coples also makes the move to a four-man front a sensible one for the Jets. At 6-foot-6, 284 pounds, Coples is an athletic edge rusher with quickness and burst. He excels at blowing past defenders with a sneaky first step and utilizes a combination of strength and power to get to the quarterback. Coples' unique skill set allows him to not only thrive off the edge, but also create havoc as an interior rusher in sub-packages. Although he was widely criticized for his inconsistent motor and effort as a collegian, Coples' natural talent is undeniable. If he plays to his potential as a pro, the Jets' defense becomes a ferocious unit along the front line. 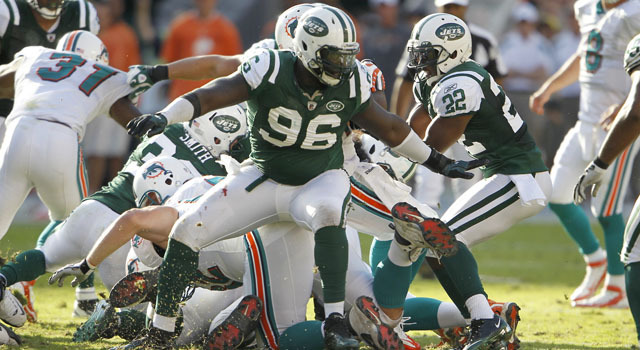 The final piece of the puzzle that makes this an effective transition for the Jets is the adaptability of Calvin Pace. The 10th-year pro has played outside linebacker for the Jets since coming over from the Arizona Cardinals in 2008, but he is a natural defensive end. He spent the first five seasons of his career with his hand in the ground, and placing him at RDE should bode well for him. While Pace has amassed 25 sacks as a 3-4 "Rush" linebacker for the Jets over a four-year period, providing him with the opportunity to pursue the quarterback full-time should result in better numbers for Pace and the Jets' front as a whole. 2. It is easier to morph into the "46" from a Base 4-3 defense. The Jets have boldly discussed unveiling their version of the "46" defense this season. The scheme, which is a variation of a "Double Eagle" defense, aligns three defensive linemen over top of the center and two offensive guards, while positioning a linebacker in front of the tight end (in pro sets) and the corners in press coverage on the outside. The strong safety is positioned beside the linebackers as an eighth defender in the box. The scheme is difficult for opponents to block in the running game, due to the presence of eight defenders near the line of scrimmage and clever alignment of the interior defenders over top of the center and two offense guards. The positioning prevents offenses from using pulls and traps to uproot defenders out of the box and makes it difficult for runners to find seams between the tackles. Against the pass, the threat of seven or eight defenders coming on aggressive blitzes forces offenses to simplify their pass protection, creating one-on-one opportunities for rushers. 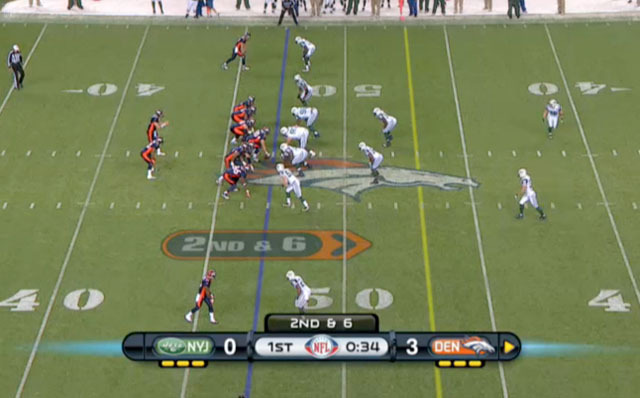 The Jets also used the scheme against the Denver Broncos to slow down Tim Tebow and the zone-read option. The tactic was effective for most of the game, and it held the NFL's No. 1 rushing offense well below its season average. 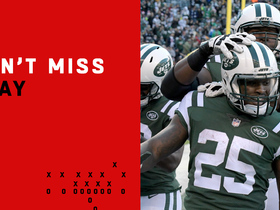 While the Jets ultimately lost the game on a late-game drive, the impressive performance provided the rest of the league with a glimpse of the potential impact of the "46" scheme. 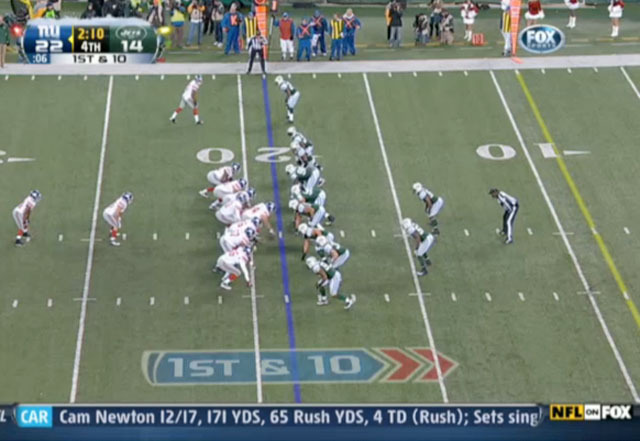 And here is an end-zone shot of the Jets' variation of the "46" defense. Notice how three defensive linemen cover up the center and two offensive guards, eliminating the gaps in the middle of the line. 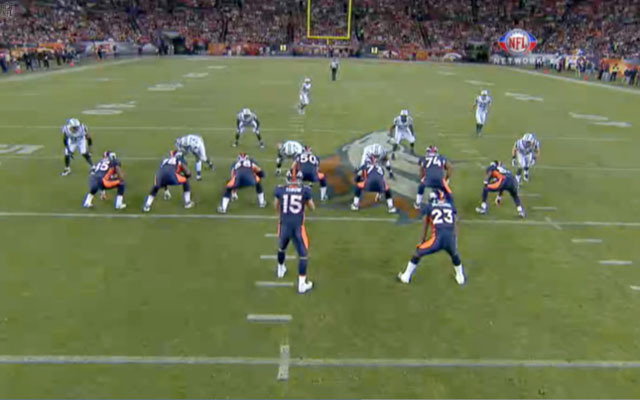 With the Jets opting to feature a 4-3 as their base defense, the "46" could become a prominent part of the game plan. It is easier to shift into the defense from a four-man front since new personnel is not needed on the field. In addition, the versatility of Coples, Wilkerson and Pace makes it problematic for opponents to predict what kind of front the Jets will align in when the huddle breaks. For instance, the Jets can line up in their conventional 4-3 on first down, and jump into a version of the "46" on subsequent downs without substituting. 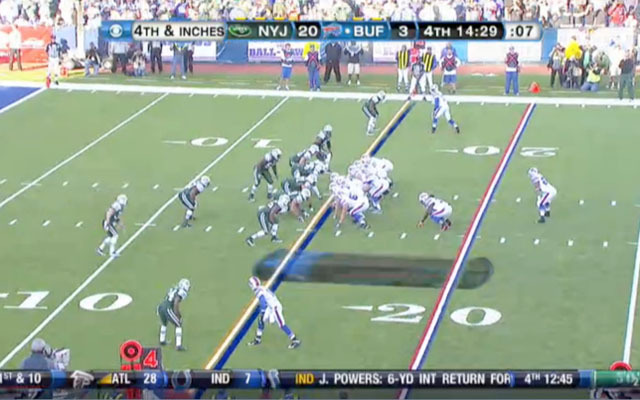 Furthermore, the Jets can also stem or shift into the alignment prior to the snap. This clouds the reads of the offensive line, which routinely results in blown assignments at the point of attack. 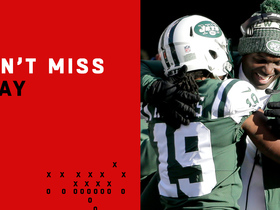 Disruptive plays are valued at a premium, and the ability to fool opponents with an amoeba-like front could produce fireworks for the Jets' defense. 3. 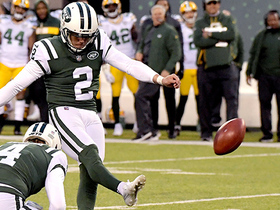 A four-man front matches up better with the Jets' AFC East opponents. 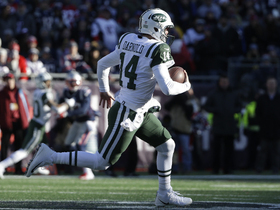 To match up with the spread-oriented offenses of the New England Patriots, Buffalo Bills and Miami Dolphins, the Jets will have to spend an inordinate amount of time in various nickel and dime packages. The Jets will extensively use 4-2-5 (four defensive linemen, two linebackers, five defensive backs) and 4-1-6 (four defensive linemen, one linebacker and six defensive backs) packages to neutralize the three- and four-receiver sets presented by their rivals. They could also use a variation of a "big nickel" package (four defensive linemen, two linebackers, three safeties and two corners) to deal with the Patriots' two-tight end formations. Although the Jets certainly possess the secondary personnel to match up with their rivals, the best way to neutralize a potent passing game is to consistently harass the quarterback in the pocket. Part of this can be accomplished by blitzing multiple defenders from the second level, but it's not the most effective way to generate consistent pressure. By relying on the front four to get after the passer, the Jets can drop seven defenders into coverage to suffocate receivers. Without an available receiver to hit in rhythm, the passer is forced to pat the ball in the pocket, leading to late sacks from hustling defenders off the edge. The Jets can also reconfigure their front to put their best four rushers on the field and ratchet up the pressure on quarterbacks. This could result in Aaron Maybin entering the game as an edge rusher opposite Pace, with a mix of Coples, Wilkerson and Marcus Dixon on the interior. With plenty of speed and athleticism, the Jets can wreak havoc on opponents with a variety of four-man combinations at the line of scrimmage.